PowerPoint 2016 was recently introduced in the market as a Preview release available for Mac users. The UI is pretty close to the flat version featured in PowerPoint 2013 for Windows and most of the features available in the Windows version seems are now available for Mac users as well. In this article, we will show you how to enable the guides & ruler in PowerPoint. These tools offer you a better control to align objects accurately over the slide. 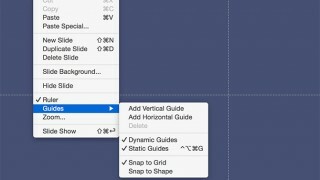 While the ruler let you measure distances between objects on the screen, guides are a very powerful tool that helps to align objects within the slide either vertically or horizontally, plus you can configure the snap to grid or shape properties to add a better control of these objects on the screen. You can configure vertical and horizontal guides (by default there is one of each type but you can add as many guides you want). Displaying guides in PowerPoint 2016 is very easy. You just need to go to the View menu and then click Guides checkbox or you can right-click over the slide and look for the Guides option. The Guides submenu in the contextual menu will show different options available, including Add Vertical Guide, Add Horizontal Guide or other options such as Dynamic Guides or Static Guides. You can also check here if you want to Snap objects to Grid or to a Shape. What is the difference between Static & Dynamic guides? While Static Guides are the guides that you configure in the slide manually to any specific position, Dynamic Guides appear on the screen while you drag or align objects. 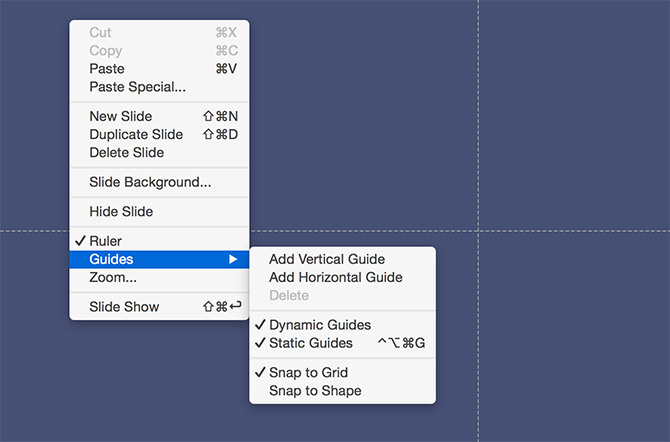 These guides are very useful if you need to align objects by dragging them in the slide. In the View menu, there are two checkboxes available that let you control whether or not to display the Ruler & Static Guides on the screen. To enable the Ruler & Static Guides make sure the checkboxes highlighted like in the figure above are checked. To illustrate this article we have used the infographics PowerPoint template that is available in our content catalog. You are welcome to download it if you want to make creative infographics in PowerPoint with colorful objects. What happened to gridlines in PowerPoint 2016? The new version of PowerPoint 2016 do not have the gridlines features (at least in the Mac version).